My post on Monday garnered a lot of attention, to say the least. Combined with posts, tweets, and emails from dozens of us in the metastatic community, something clicked, and I was contacted Monday afternoon by a senior producer at the TODAY show who had seen my blog post. It took a solid ten minutes to pick my jaw off the ground. She was exceptionally warm and apologetic about how things had been handled last week, and promised me she'd do her best to make this right. She is also a breast cancer survivor. We had an exceptional conversation, and then she asked if I'd be willing to share my story in a segment she was putting together to air Thursday morning. I didn't hesitate. 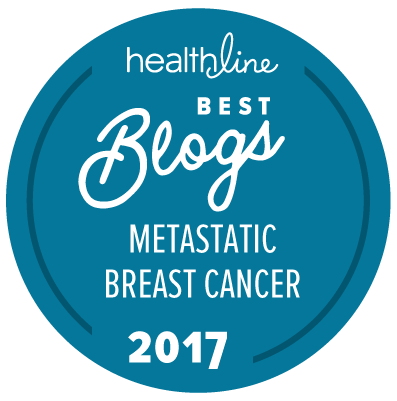 Of course I'd take advantage of such a huge platform to share some real information about living with metastatic breast cancer. It came together quickly. A production crew was at my house filming and talking to me about my experience for three hours yesterday. The producers at TODAY have been incredible to work with, and I trust that when all of this boils down to 2 minutes tomorrow morning, they will do justice to my story -- our story -- one that isn't often told amidst the pink hoopla of October. I hope I make this community proud. To all my sisters in mets, I tried to speak from the heart, to beg for more research as it is our only chance of surviving, and to educate about what it means (and looks like) to live with Stage 4 breast cancer. I'll be holding my breath watching with the rest of you at 8:15 tomorrow morning (and then I'll post the link to the segment here when it's available). As always, thank you all for your unwavering support. I look forward to your link later today. You did great! Thank you for speaking up. Stage 4ers are always left out of the discussion. I'm a young mom going through the same issues as you and never would have found your blog if you didn't post your experience with the Today show. I've been binge reading all your blog posts. Having this disease is so isolating. I have friends and family who care about me, but they don't know what its like to live stage 4 every day. Your words have given me comfort. Thank you for sharing your experience. Thanks for sharing your experience with me, Ann! My whole goal is to be heard, to have more of us heard, so that we don't feel so isolated and left out every October. I have hope that the conversation is shifting.